As graduate students, Kristen Horton ’19 and Celia Castro ’19 have become used to the routine of taking courses at the University of Redlands’ scenic main campus. But recently, one of their U of R courses at a quite different location has required layers of protocol. First, they must make their presence known by speaking into an intercom, then they pass through a metal detector, and finally, they are buzzed through a series of doors until they reach their classroom at the San Bernardino Juvenile Detention Center. 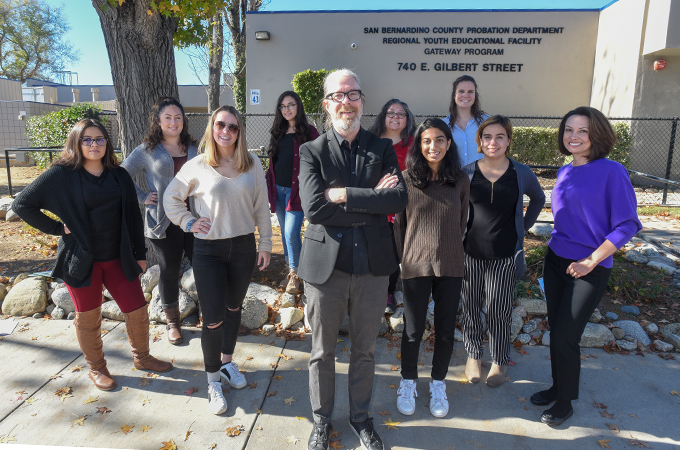 The course, Critical Perspectives on Education and Inequality in America, is taught by Professor Brian Charest and brings together 15 University of Redlands education students and 15 incarcerated youths for discussion about the purpose of public education in society and the intersections of race, class, gender, and discipline in schools. The class is part of a national network called the Inside-Out Prison Exchange Program, an organization that encourages college students and incarcerated people to explore issues of crime and justice together, inside prison walls. Horton, who is working towards a master’s degree in learning and teaching, and Castro, a doctoral student, quickly signed on to take the course. Both of them have experience working with underserved youth in the Inland Empire. Horton has a background helping foster children and working with Riverside Court Appointed Special Advocates (CASA), an organization that seeks to support abused or neglected children. As a high school art, drama, and English teacher in Fontana, California, Castro says that a number of her students have already been through the juvenile justice system. Inside the classroom, Charest has the students rearrange the desks—which are initially formatted in rows—into a circle where every outside student sits next to an inside student, naturally facilitating discussion. Charest often uses certain exercises to break the ice between students, some of which he learned during an Inside-Out Prison Exchange Institute that he previously attended at a state prison in Michigan. From philosophical debates to conversations about educational policy, both women say that Charest’s methods of teaching have leveled the playing field among the students and allowed for heavy interaction and engagement. Both women note that the experience from the class will travel with them as educators in the future. During the course, Castro read various studies about how teachers’ voices can trigger students’ past traumas. She has begun to work on the way that she uses her voice in her own classroom and is more mindful of how students react to her. She says that she also plans on using some of Charest’s ice-breaking exercises with her own students at the beginning of the new school year. Learn more about the Master of Arts in Learning and Teaching (MALT) and the Doctorate in Leadership for Educational Justice (Ed.D) programs at the University of Redlands School of Education.